Hi, everyone! I was working on a new crochet pattern for spring baby booties that will be released very soon and come to the conclusion that there is no need to repeat how to crochet baby sole all the time and edit it over and over again when I am working on a new baby bootie video tutorials if the sole is always the same. So I’ve decided to make a simple video tutorial and written instructions for how to crochet a baby sole that will be compatible with all the upper parts of my baby shoes that I will release in the future. The size of the sole is around 9.5 cm or 3.75 inches and will be a perfect fit for 0 – 6 months old baby. Let’s switch on the things you might need or would I recommend for this tutorial. CROCHET HOOK: 3.5 mm (E/4) and 4.0 mm (G/6) crochet hook or hook to obtain the gauge (HERE!). OTHER: stitch markers (HERE! ), yarn needle (HERE! ), scissors (HERE!). Gauge: 10 sts and 6 rows in HDC to measure 5 x 5 cm (2 x 2 inches). The final measurement: 9.5 cm (3.75 inches). Round 2: Ch 1. Work 2 hdc into next 2 sts. 1 hdc into next 7 sts. Work 2 hdc sts into next 6 sts. 1 hdc into next 7 sts. Work 2 hdc into next 2 sts. Join the round with a ss. = 34 sts. Cut the yarn and hide the tail between the sts. Now find the upper part of the shoe you love and continue with your work. Please have in mind that this crochet baby sole is compatible with the upper parts of baby booties that you can find on my blog (at least from this day forward). Every crochet designer’s sole pattern for baby shoes is a bit different and this is just me sharing how I do mine. a few of our group is going to make your patterns, they are so cute; W are trying to start a crochet craft shop with knitting. I have been crocheting for 45 yrs, and I love your patterns, especially because your patterns are easily followed and also just too cute. Keep up the good work. And, I started crocheting at the age of 9 yrs, and have enjoyed it ever since. Should rounds 2 and 3 start with a ch1? Thank you for taking the time to help us! 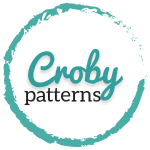 Your patterns and videos are so easy to follow! I have been doing a lot of your Patterns and love them all the time. Thank you to bring so lovely Designs out. So my issue is I use yarn Drops Muskat with Hook 3.25 or 3.5 with your Patterns (following your instructions) but never come to the measurements that you state for the Sole legth… So with chain 14 i.e. my Sole will only barely measure 10cm. So I have to adapt quite a bit for the Sizes and therefor the with will suffer too… If I go ch.16 the sole gets quite long for the with it has. Can you tell me what I might me doing wrong? Thank you very much. Drops Muskat is in my opinion great yarn for amigurumi animals, but not so great for the baby booties. The colors are so cute, but it’s a bit thin for making a baby sole using my crochet pattern. The final size of the sole (like it did in your case) will come out too small. I would recommend you to try with a thicker yarn, maybe something like Drops Cotton Light (it tend to split a lot) or Paintbox Yarns Cotton DK (https://www.lovecrochet.com/paintbox-yarns-cotton-dk?a_aid=54234c53) Hope it helps. Happy crocheting! Thank you sooooo much for your videos and written patterns. They are a the best directions I ever found anywhere…. not to mention how cute they are… THANK YOU!!! ? Thanks so much Doroteja. I really enjoyed your tutorials. So detailed and easy. Just what i have always wanted. Keep doing the great job. Hello! I am new to crocheting and am trying to develop my skill with something that would be useful, like these soles for baby shoes. I compared this pattern with some others on your site and discovered how to make it larger for my 12 month baby. Chain 13 to start then 10 hdc instead of 7 when required. This was very helpful, thank you. My only question is that the second sole I made turned out substantially larger than the first. I was very impressed with my first attempt—I should be, as I took it out about 50 times!—but the second sole is a little more inconsistent. The holes are larger. Do you think this just the result of not having enough tension, or too much tension? I’d like to get two soles that are similar so that one is not so much bigger than the other. Also, used same yarn and crochet hook for both soles. The tension is something you get with time and experience. When you are creating two items, using the same pattern you can see how consistent your tension really is and believe me we all were struggling on this part. When I first started, I’ve made 3 baby booties and all of them were a different size. But this is not bad. It actually gives you a lesson. So if holes between the stitches are bigger than they’ve should be, your stitches are a bit loose (there is nothing wrong with that if that’s your tension and if it’s always like that) and this is the same as if you would crochet with a larger crochet hook. So your final item will be bigger. 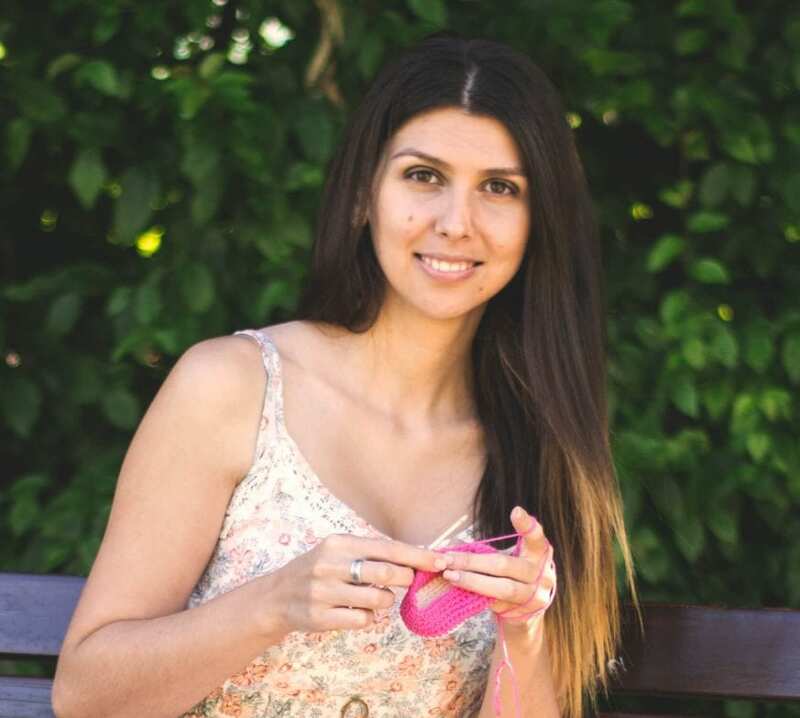 What I would recommend you to do is, find a crochet pattern for a scarf with consistent stitches…so made of double crochet stitches, single crochet stitches…you can even write your own pattern…and work on your tension. You can also try my pattern for crochet baby blanket (here: https://crobypatterns.com/easy-beginner-crochet-baby-blanket/ ) Hope it helps. 🙂 Happy crocheting! hi, i really enjoy your tutorials. but, i just have polyester yarn. can polyester yarn make the baby booties, too? If we need to increase the sole what we should do? Hola qué tal estamos? Tengo una pregunta que hacerte. ? Que tengo que hacer para una suela de zapato para un niño de 7 meses, con cuántas cadenetas tengo que empezar, si fueras tan amable de mandarme un patrón de suela de zapato te lo agradecería mucho. Un saludo que pases buen día. Where is the second video on how to make the upper part. I have a baby 12 months, so how many chain i need tl start? Thank you for the great instructions. I was unable to subscribe 🙁 as the button won’t work for me. Yes I did enter my email address. But I bookmarked your page and will be back for more. A question: when I finally master the art of crocheting baby booties, is it okay to sell the final products on Etsy? I looked for the disclaimer but couldn’t find. Most other sites have a disclaimer that it’s okay but need to link to you somehow (am not sure that Etsy allows this). You are an absolute fabulous teacher! Your patterns are well written & your videos are wonderful. Great instructions & so easy to follow, thank you so much ? Hi, your tutorial has been the easiest to understand, you are a great teacher! But now how do I start for 6-9 month booty? Hi! I used the DK yarn and 3.5 mm hook but the sole final measurement is only 7.5 cm. I don’t know why it happened. Could I know your sole gauge? Thank you, I’d love your designs. Thank You for making this such an easy pattern! I truly enjoy your work! Thank you for the pattern very easy to follow ! Hi. I love your tutorials and easy to follow. after several attempts, feeling like an expert to make the soles 🤣🤣🤣 (only for soles). need to do a lots of practice. am still learning. glad to have found this page. thank you sharing. This is the best sole pattern I’ve found ! Easy to follow and simple to remember, I’m now making them without having to look at the pattern. Thank you so much. Thank you so much for your pattern it was so easy to follow!